No formal activity planned, but let's get together and hang out with our birds! There will be snacks and treats. See you there! 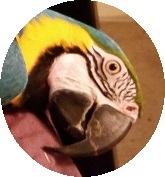 We are happy you found us and would like to extend an invitation for you to join our society of parrot-crazy folks! 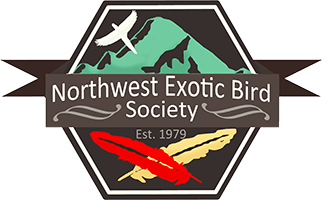 Founded in 1979, the Northwest Exotic Bird Society (NWEBS) is the oldest bird club in the Puget Sound area. Our mission is the promotion of responsible aviculture, education and support for exotic bird owners and breeders. NWEBS meets monthly in Seattle presenting speakers, activities, and events on a wide-range of bird topics and publishes a newsletter quarterly. 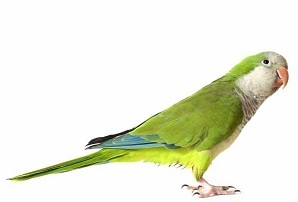 NWEBS is also the Washington State affiliate of the American Federation of Aviculture (AFA). If you are interested in parrots and pet birds, come on down. We would love to meet you! We meet in the Lawn Bowling Building near Greenlake in Seattle on roughly the 3rd Sunday of every month. Check out our Calendar for upcoming events. More about Ruffles : Raised from a baby, Ruffles turned 21 in May but still enjoys to be spoon-fed. She really loves pistachios and if she doesn't get one or two during feeding time she gets grumpy! She listens to the radio when we're out of the house and she likes the new hits.Always a star, she talks and makes kissing sounds.No matter how old she is she'll always by my baby bird! 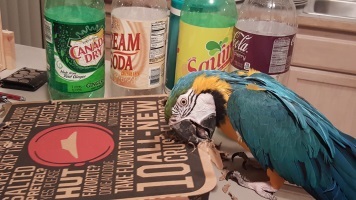 She's not afraid to get into things and she also loves chewing on anything she can get her beak into, like a nice fresh pizza box.